InfoSWMM is developed as an Extension of ArcMap. Individual or logically grouped data editing, viewing, and management features are available as commands within ArcMap. The InfoSWMM and the ArcMap toolbars are bundled together and may be accessed from the View ->Toolbars command. Additionally you may right click on any section of your ArcMap/InfoSWMM user interface other than the Drawing Area to invoke any of the toolbars. Also you may point to Tools -> Customize -> Toolbar and select the toolbars that you want to invoke or activate. 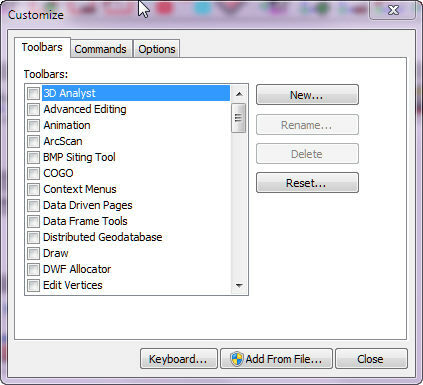 The activated toolbars may be docked on any part of InfoSWMM’s user interface. For more information on the ArcMap tool bars refer to your ArcMap help file. Detailed instructions on the usage and the capabilities of the InfoSWMM toolbars are provided in the InfoSWMM toolbars section. The following are the different tool bars provided by ArcMap.